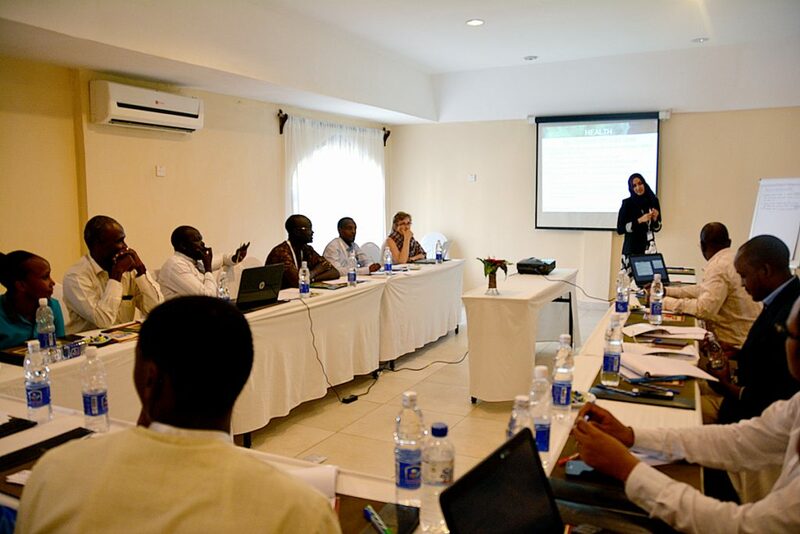 Yohana Tesfamariam Tekeste reports from a workshop on climate resilient development held in August in Zanzibar. In 2005, the International Research Institute for Climate and Society published its assessment of key gaps in the use of climate information for health, agriculture, water and other sectors in countries across Africa. The results from the report were less than stellar. After an extensive review of use of climate information in the development sectors of Africa, the authors concluded that the continent suffered from “market atrophy” – the reinforcing effect of zero effective supply of climate information and zero effective demand. Twelve years later, we are making enormous strides at increasing both climate information supply and demand through the implementation of climate data platforms and the organizing of capacity-building seminars. 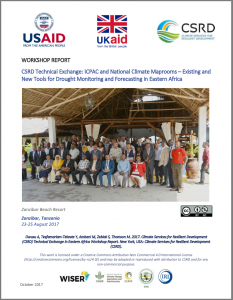 IRI recently helped to organize the Climate Services for Resilient Development (CSRD) Technical Exchange workshop in Zanzibar on August 23-25, 2017, which was held immediately after the 47th Greater Horn of Africa Climate Outlook Forum (GHACOF47) in order to capitalize on the presence of many climate and sector experts from across the region. The workshop was designed to offer potential and existing users a platform to voice their needs for the development of drought tools. Notably, participants also had a chance to use the rapidly developing Maprooms now available in many countries, thanks to the Enhancing National Climate Services (ENACTS) Initiative. ENACTS products and services are transforming local capacity by using high-quality climate data that adds more value and outcompetes those produced by global suppliers. The Maproom interfaces provide an array of maps, graphs and tools to help users understand and visualize their country’s past, present and future climate. Break-out discussions with participants made it clear that there were many opportunities for further development of the Maprooms and numerous requests were made for additional training and capacity-building workshops. “This is the first time that multiple sectors joined in collaborative discussions about the Maprooms and offer feedback on how to improve them and add new functionality,” says Madeleine Thomson, a senior research scientist at IRI. Click on the thumbnail image to download the workshop report. These experiences demonstrated how much has changed since 2005 and how tantalizingly close climate services are to delivering real utility in climate-sensitive sectors in Africa. The health community in particular had significant representation at the workshop, with individuals from national ministries of health, as well as malaria, vector-control, and emergency response programs and the OneHealth Initiative. They had lively discussions on the potential of the Maprooms to serve their current programs and teams. Many from this group also served as moderators, panelists and chairpersons. 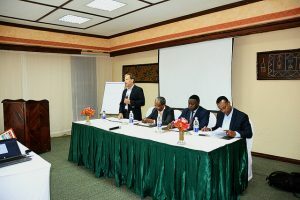 Dr. Adugna Woyessa, a malaria expert at the Ethiopian Public Health Institute, said the Maprooms helped his team generate evidence of the role of the El Niño-Southern Oscillation on malaria and present a policy brief to the Ministry of Health to draw attention to the matter and guide actions. The ENACTS Maproom hosted and maintained by Kenya’s Meteorological Department. Find out more on the ENACTS landing page, which contains training materials and factsheets as well as links to all participating and implementing countries (Ethiopia, Tanzania, Kenya, Rwanda, Madagascar, Zambia, Mali and Ghana) and regional climate centers (AGRHYMET and ICPAC). Additional countries including Uganda are expected to join the ENACTS family soon.